Although the different organs of the digestive tract are specialized for digesting different types of food, the basic chemical process of digestion is the same for fats, proteins, and carbohydrates. In every case, this process requires enzymes. Enzymes are catalysts, substances that speed the rate of chemical reactions, but are not themselves changed or used up in the reaction. All enzymes are proteins, and they are highly specific in their actions. In digestion, an enzyme acts only in a certain type of reaction involving a certain type of nutrient molecule. For example, the carbohydrate-digesting enzyme amylase only splits starch into the disaccharide (double sugar) maltose. Another enzyme is required to split maltose into two molecules of the monosaccharide (simple sugar) glucose. Other enzymes split fats into their building blocks, glycerol and fatty acids, and still others split proteins into smaller units called peptides and into their building blocks, amino acids. Because water is added to nutrient molecules as they are split by enzymes, the process of digestion is referred to chemically as hydrolysis, which means “splitting by means of water.” About 7 liters of water are secreted into the digestive tract each day, in addition to the nearly 2 liters taken in with food and drink. You can now understand why so large an amount of water is needed. Water not only is used to produce digestive juices and to dilute food so that it can move more easily through the digestive tract, but also is used in the chemical process of digestion itself. 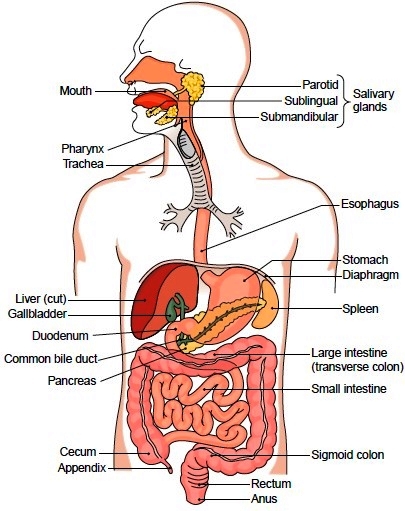 Figure 15-4 The digestive system. Let us see what happens to a mass of food from the time it is taken into the mouth to the moment that it is ready to be absorbed. In the mouth, the food is chewed and mixed with saliva, softening it so that it can be swallowed easily. Salivary amylase initiates the process of digestion by changing some of the starches into sugar. Digestion in the Stomach When the food reaches the stomach, it is acted on by gastric juice, with its hydrochloric acid (HCl) and enzymes. The hydrochloric acid has the important function of breaking down proteins and preparing them for digestion. In addition, HCl activates the enzyme pepsin, which is secreted by gastric cells in an inactive form. Once activated by hydrochloric acid, pepsin works to digest protein; this enzyme is the first to digest nearly every type of protein in the diet. The stomach also secretes a fat-digesting enzyme (lipase), but it is of little importance in adults. The food, gastric juice, and mucus (which is also secreted by cells of the gastric lining) are mixed to form chyme. This semiliquid substance is moved from the stomach to the small intestine for further digestion. * Lipase. After bile divides fats into tiny particles, the highly active pancreatic enzyme lipase digests almost all of them. In this process, fats are usually broken down into two simpler compounds, glycerol (glycerin) and fatty acids, which are more readily absorbable. If pancreatic lipase is absent, fats are expelled with the feces in undigested form. * Amylase. This enzyme changes starch to sugar. * Trypsin. This enzyme splits proteins into amino acids, which are small enough to be absorbed through the intestine. * Nucleases. These enzymes digest the nucleic acids DNA and RNA. It is important to note that most digestion occurs in the small intestine under the action of pancreatic juice, which has the ability to break down all types of foods. When pancreatic juice is absent, serious digestive disturbances always occur. The small intestine also produces a number of enzymes, including three that act on complex sugars to transform them into simpler, absorbable forms. These enzymes are maltase, sucrase, and lactase, which act on the disaccharides maltose, sucrose, and lactose, respectively.